Inspired by the enormous success of “I Wanted My MTV: an Anti-VMAs party” at Last Exit, it seems that Brooklyn wants its MTV – but how it USED to be! 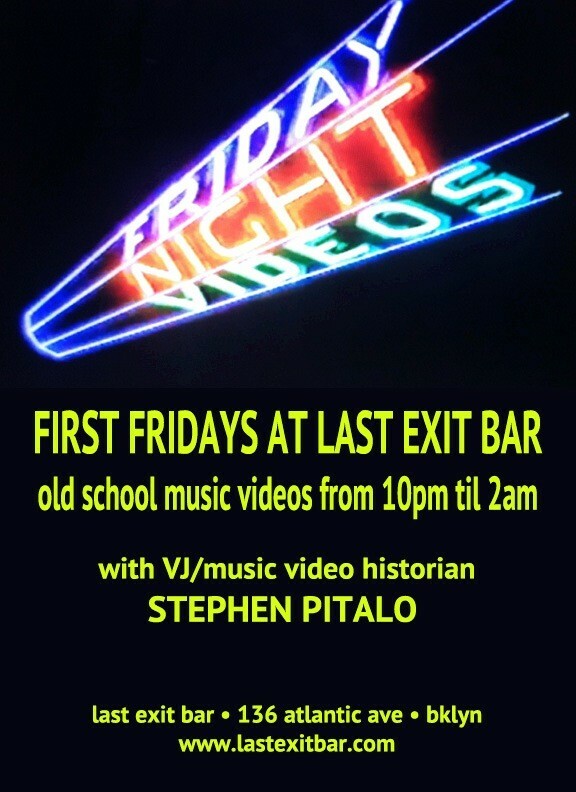 Last Exit (136 Atlantic Avenue, Brooklyn) and THE GOLDEN AGE OF MUSIC VIDEO now satisfies your cravings with FRIDAY NIGHT VIDEOS, our 80s & 90s music video party every first Friday of the month, with big hits & forgotten gems on the big screen 10pm to 2am. This tribute to the greatest era of music videos is curated by your favorite VJ & music video historian, Stephen Pitalo of GoldenAgeOfMusicVideo.com. Tweet your requests to @LastExitBar & come see us for an old-school video fix! Come see Stephen & say “I Want My MTV” for secret prizes! Launching September 6th, just down the street from the Depeche Mode concert at Barclays Center. If you attend the concert, come show us your ticket and get super awesome SWAG!